Ever since the introduction of the first modern Central Processing Unit (CPU) we have been in a race to make them smaller, faster and more efficient. Many companies have popped up on the radar in the years between that day and now yet in the long fight for your computing needs two companies have really been in the forefront since the mid-1990s; Intel and AMD. These two have fought a battle of reduced manufacturing processes, component integration (the memory controller, GPU, Northbridge, etc.) and of course performance. The battle field has been predominantly for your desktop and in the datacenter until a few years ago when mobile computing became a major push for everyone. Sadly both Intel and AMD missed the initial boat for mobile and they allowed ARM to slip in and gobble up the market share. 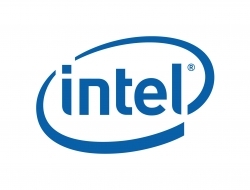 Both companies reacted quickly, but it can be hard to change the direction of a company like Intel. Much like the proverbial charging rhino once the direction is changed thing get moving very and can ramp up very quickly. Now 4 generations into Intel’s Core architecture we are seeing the outcome of that charge in Haswell. This new CPU series is an unexpected jack of all trades in the range of products that it is built to work in. We only have the desktop flavor to show you how Haswell performs, but we will also dive into just how wide a range Haswell will have in the market. Let’s get started. Although most people will credit Apple with the push to mobile computing the credit actually goes to the marketing genius that coined the term “desktop replacement”. This designation was meant to describe a portable computer that could do the same job as an average desktop. It was not meant to do everything, but it could do enough to get you by. This term and the reduction in price for laptops is what helped open up the market to the average consumer. It would not be until a few years later than the smartphone craze hit and ARM managed to gain the massive share they have in the mobile market. Still there were problems in the mobile market that were inherent in the design of the products. Most of these issues were related to storage, weight, CPU speed, graphics, and of course battery life. For a long time that you could not have everything and had to pick and choose the items you wanted to sacrifice. Even today when picking out a laptop there are always compromises. Intel, AMD and ARM have been working to find the answers to these issues. With the 4th generation Core family Intel hopes to offer a solid base to build on for mobile device manufactures who may finally be able to build a real desktop replacement. Haswell will be one of the first CPU lines to offer a single chip BGA solution for mobile devices. This includes the CPU and PCH in a single package to make product design and manufacture simpler. Of course they will also offer the more traditional 2 chip package for those that are looking for this style. 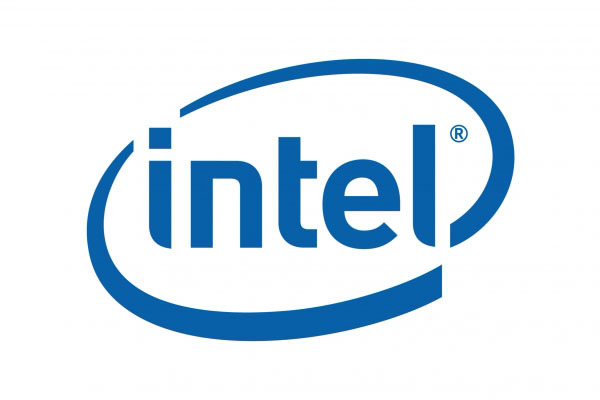 Internally Intel has reduced the power needs while maintaining a respectable performance level. 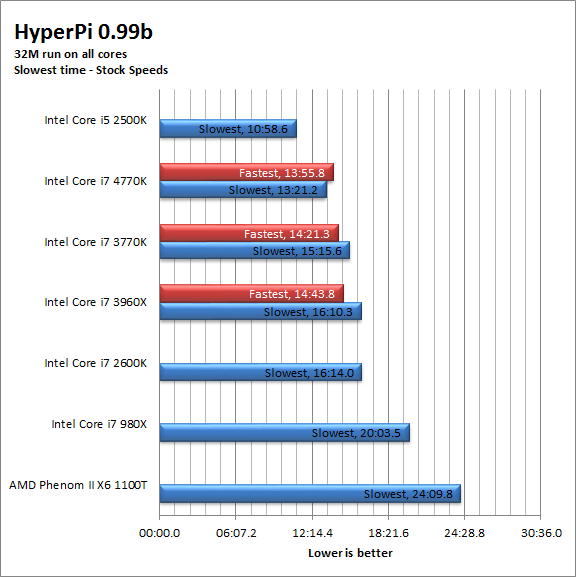 They have also worked very hard to correct their deficiencies with their internal GPU and are claiming a 3x increase in performance over the GMA GPU in Ivy Bridge. If Haswell can deliver on the promises of decreased power usage as well as increased CPU and GPU performance then it represents a significant improvement in the mobile market. Sadly we do not have any mobile devices with Haswell in them for this review, but we do have their desktop offering the Core i7 4770k. A couple of months ago the internet went a little crazy as reports of Intel’s new BGA package CPUs were leaked. Someone decided to put two and two together, but they ended up getting five and started a healthy rumor that Intel was getting rid of their desktop CPUs. The fact that even a casual look at the market would have shown how foolish this notion was escaped many readers and sites as they reposted the news around the net. Have no worries though, Intel is not going to give up in the very popular (and lucrative) desktop market. Intel is changing the Socket with Haswell (LGA 1150 now) and pushing even more into this 2nd generation 22nm processor. So what exactly are you getting with a new Haswell Desktop CPU? There are a few things that Intel has been working on and promising in Haswell that are sure to spark the interest of consumers from the most basic user right up to the enthusiast. We will be diving into the real world performance of Haswell in the form of a Core i7 4770k CPU, but before we talk about raw performance numbers let’s look over some of the improvements in Haswell and what they will mean to you. Although this seems like a very small item to talk about it is important as we know from past experience that the first generation of a new process can have challenges meeting the performance expectations of some parts of the market. 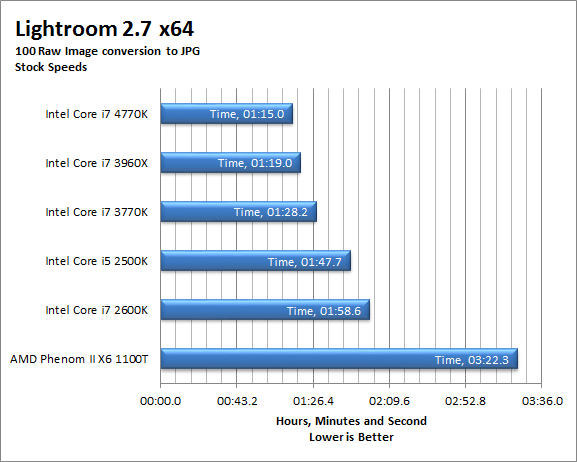 In particular the overclocking community was rather upset about the performance that Ivy Bridge showed. Although most chose to blame the use of the thermal interface material a quick look at history will show that CPUs using a new process do not overclock as well as the second generation. Because of this we expect to see improved overclocking which actually translates into longer product life and a more robust product. Here things get interesting for the content creators Intel first introduced AVX in 2008 with the intent of improving the way CPUs handle data. The instruction increased the SMID width from 128-bits to 256-bits and increased the operands from two to three. 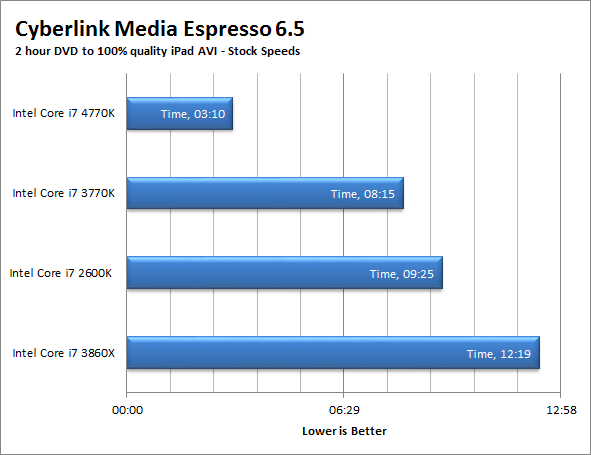 AVX also increased floating point performance significantly which helped boost multimedia performance (encoding/decoding). 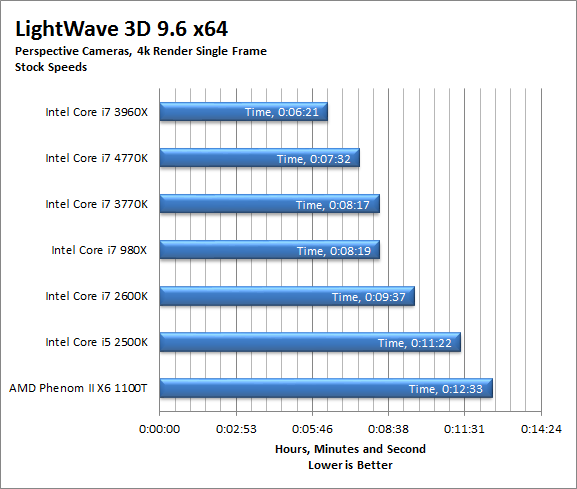 AVX was an interesting way to bring more parallel performance to the CPU. In AVX2 Intel is finishing up the task they set themselves with AVX. Almost all integer operations are not 256-bits wide. The 3 operand SMID includes general purpose registers and FMA3 operations. The upshot of this is that you will get a boost to your audio and video encoding/decoding. Blu-ray, HD and 4k video playback will be smoother under this CPU regardless of the GPU you chose to use. You should also see some gain in performance with 3D modeling and rendering applications as the new instruction set will be able to handle the heavy math that these tend to throw at a CPU (including ray tracing). These new instructions are also much more efficient and allow the CPU to perform its work while consuming less CPU time and power. In Ivy Bridge and Sandy Bridge the L3 Cache was in lock step with the CPU. A change to the Bclk (BaseClock could have huge impacts on the CPUs ability to properly cache instructions; because of this only minor adjustments to the Bclk were possible without the system becoming unstable (unless you turned off cores). By putting the L3 cache on its own you remove this limitation and allow overclockers a bit more flexibility in what they can do with the BaseClock and should improve efficiency in general. TSX is a new addition with Haswell and brings hardware transactional memory support to the CPU. It allows better control on locking without the need to specifically program for it. TSX is a low-level programing feature and allows a programmer better flexibility with respects to how hardware works with their code. At this stage the hardware can determine if it needs to run in locked memory space or not it is a much more efficient way to program over requiring everything to synchronize in memory. TSX also prevent unnecessary serialization of code blocks as even protected code can run concurrently as long as they do not need access to each other’s data. TSX is another item that Intel is using to increase parallelism in their CPUs. TSX only applies to applications that can share data without an issues, if this is not possible then the old serial method of code execution is there as a fall back. As we mentioned earlier in this article Intel has not always had the best GPU to toss into the mix. Intel recognized that their GPU is one of the items that was holding it back in the mobile and desktop markets. As our systems move to less conventional designs (All-in-One) we see the need to have low power CPUs and GPUs. The problem is that you really cannot have both at the same time. Even if you have a discrete add-in GPU you cannot use it all the time as they typically eat up battery power. There are solutions for this, but they are often complex and have their own performance overhead to deal with. AMD actually realized and created the APU to combat it, but in the end you have a graphically capable GPU, but the core processor is underpowered for many compute needs. By redesigning their GPU Intel is trying to create a best of both worlds solution, this is a departure from their older “good enough” graphics model and they are clearly acknowledging that people do want high-performance graphics on their mobile devices. Interestingly the desktop will not be getting the top end of the graphics range, the Iris pro 5200, but they will be getting the GMA 4600 which is still intended to give an improved graphical experience than what we previously have seen from Intel. At first look the exclusion of Iris Pro graphics from the upper end of their desktop line looks bad for Intel, but when you really look at it you can see that it is not. Intel recognizes that someone buying the Core i7 4770k is likely to also have their own GPU to drop in so there is no reason to put the extra GPU into it. There are obviously other improvements to be found in Haswell including an extra two execution ports, a possibility to up to 128MB of L4 cache and an internal power regulator for the CPU and iGPU. Overall things are looking good for the 177mm^2 chunk of silicon which contains an estimated 1.4 Billion transistors, but we wonder about the shift to a more mobile oriented CPU and its implications for performance on the desktop. Haswell represents a significant change in the way that Intel is designing processors, we could see some performance differences in our usual testing suite because of this. So with that in mind let’s dive into the actual performance numbers. 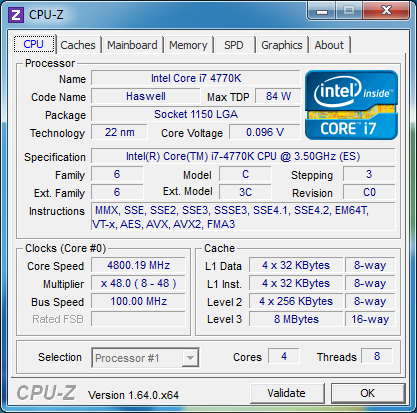 It seems that each new generation of Intel CPUs brings new overclocking challenges and Haswell is no different. As with Ivy Bridge there are temperature issues to consider when overclocking and now you also have to deal with voltages to the CPU cache. This makes getting a high clock speed tricky, but not impossible. We were able to hit 5GHz very easily, but it was nowhere near stable. We ended up having to back things off to get a bench stable overclock of 4.8GHz. This is not yet a 24/7 clock as we have not put it under the stress of prime or another intensive application, but it does meet the requirement of running all of our internal benched back-to-back without any errors. 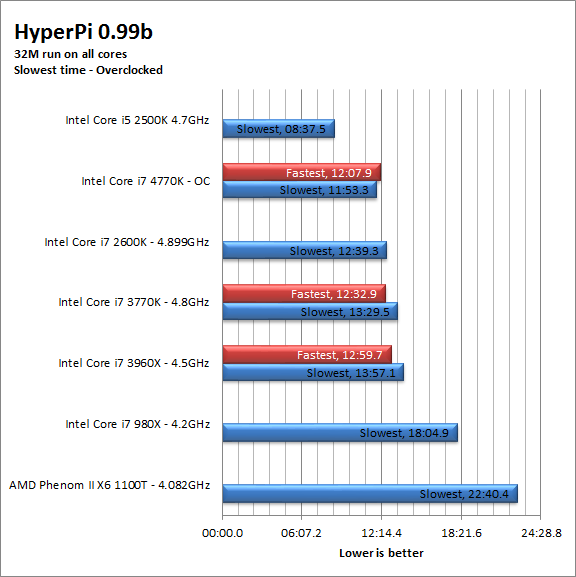 The temperatures that we saw were not bad although, to be honest, we expected better as Haswell is a more mature 22nm CPU. Idle temps were taken after 30 minutes of operationn with no applicatons running other than background proesses. We used CoreTemp and Asus AISuite III to mesure them. Load temperatures were taken at loop 23 of a 32M HyperPi run (100% CPU on all cores for around 10 Minutes). Intel’s latest CPU requires a new socket and chipset. Both of these are accomplished with the new Z87 chipset and the LGA1150 socket. You are losing 5 pins from the last socket which is an interesting trade off over the last few generations (1156, 1155 and now 1150). 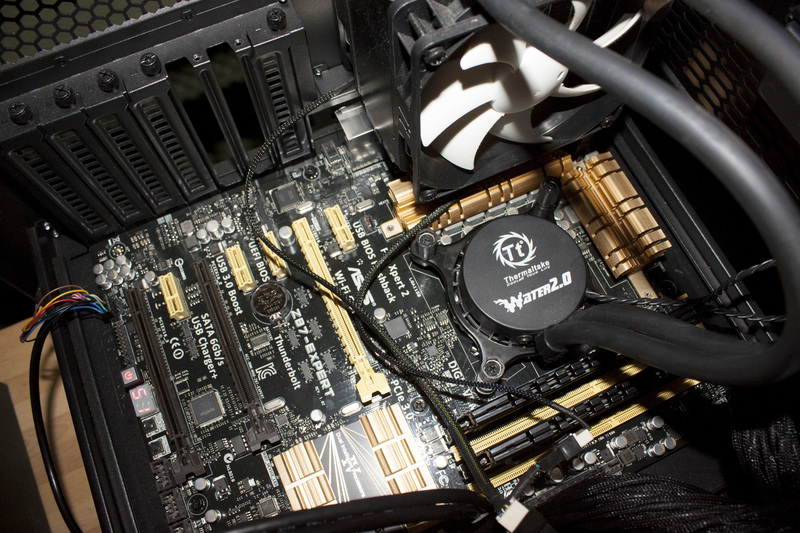 For our tests we went with Asus’ Z87- Expert board. It is not the top of the line Asus, but it represents a solid base for performance with the Core i7 4770k CPU we are using as our test sample. 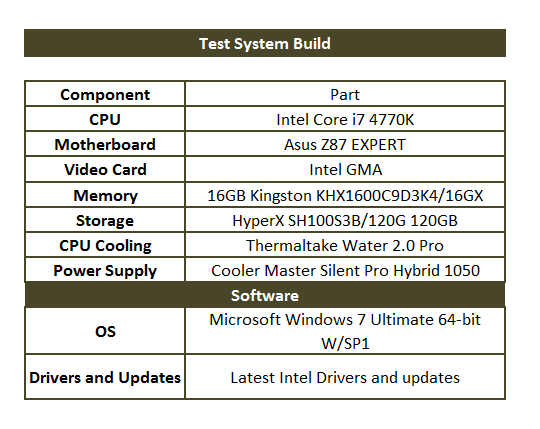 You can see the rest of the specs below. For our first run we will be testing with Windows 7 x64 with service pack one. We decided to us Windows 7 instead of Windows 8 because Windows 7 is a much more common OS. 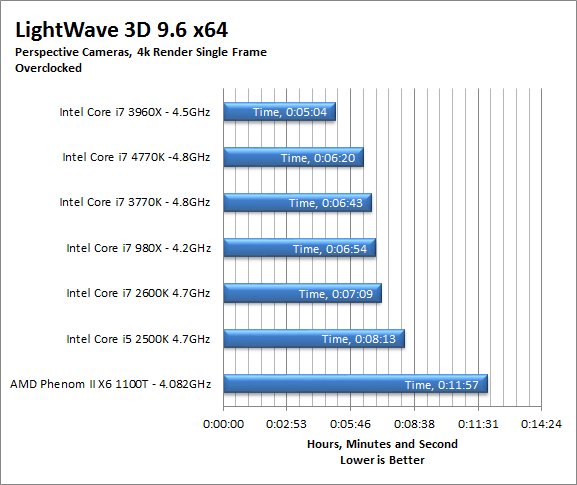 We will be taking a look at how the Core i7 4770k performs with Windows 8 in a later review. 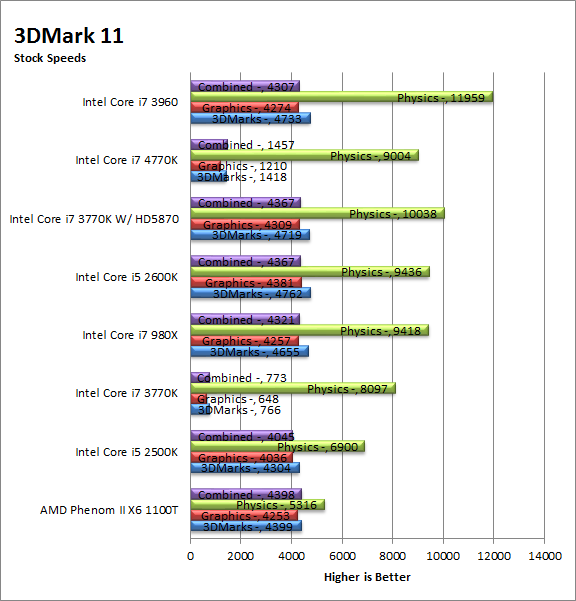 PCMark7 is the latest general performance test from FutureMark. As each generation of this benchmark has evolved and developed we have watched them add more and more realistic tests to this suite. With this generation we find more media tests, (audio and video transcoding) moving of large files, multiple web page rendering, and much more (they even added DX10 gaming). We use the Overall Performance and Common Usage suites in our testing. 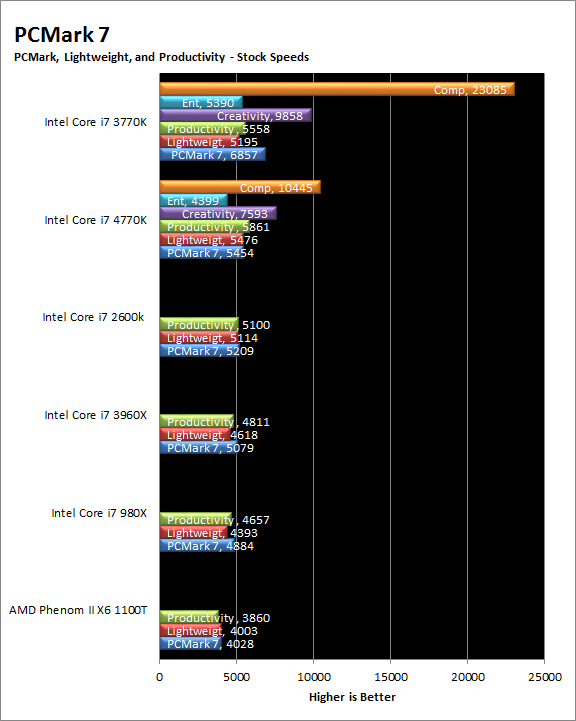 For some reason Intel’s latest and greatest is falling behind older Ivy Bridge CPUs. 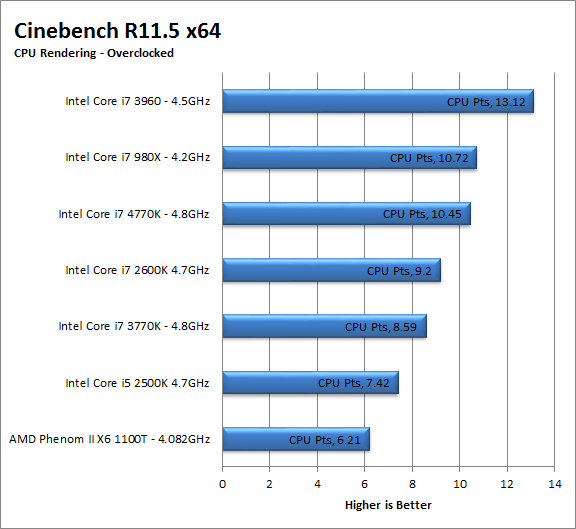 We are seeing the new 4770k just cannot keep up with our older 3770k. This is a little disappointing as we expected to see at least a marginal performance increase over the last generation. Of course we could also be seeing motherboard and or chipset issues so we will be taking a look at these numbers again on another board very soon. 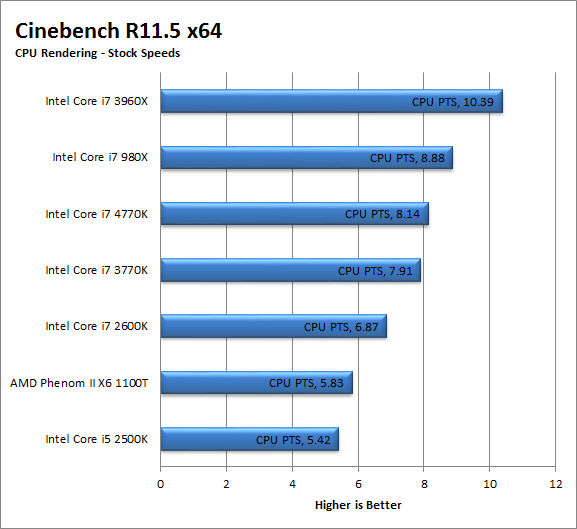 Here Haswell shows has something of a comeback in terms of raw performance. Although the new iGPU cannot keep up with a discrete graphics card there has been a significant improvement in performance. 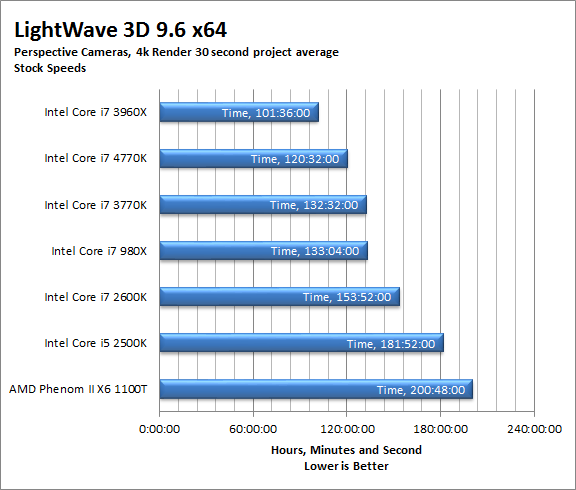 The increase is not exactly the 3x that we were told, but it is right around 2x the performance of Ivy Bridge. The physics performance also shows a decent increase (about 11%) which is certainly nothing to be disappointed about. We are more than a little surprised at the numbers here. Clearly Haswell is intended for multimedia functions and it looks very capable of handling this task. However, there should be no reason to lose performance ground in other compute tasks. We are disappointed to see that in almost every other CPU test Haswell is behind the last generation CPU even overclocked it still does not keep up. Let’s hope that this is just and issue with SANDRA as we move though the rest of our testing. While we were reviewing or data with Intel to make sure that things were not amiss Sisoft sent out a new version of SANDRA that can test is native AVX2 for some of their benchmarks. 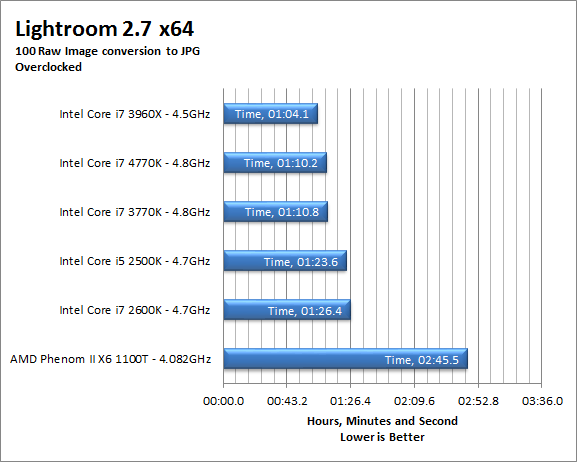 We re-ran all of them on the Core i7 4770k we have and now have the data below. While many scores did not improve we can see the effect of native AVX2 on multimedia encoding and also encryption/decryption. Here the scores for the same tests are dramatically increased. The 4770k shows that it does have some computational power inside as it does a very good job on calculating Pi out to 32 Million places eight times at once. The only CPU that it did not beat was the 2500k which only has to run one instance of SuperPi per core. This is a pretty impressive showing and is certain to help with encoding and decoding, but we are not sure if this raw performance will help with other more general computing tasks based on some of the other tests we have run. 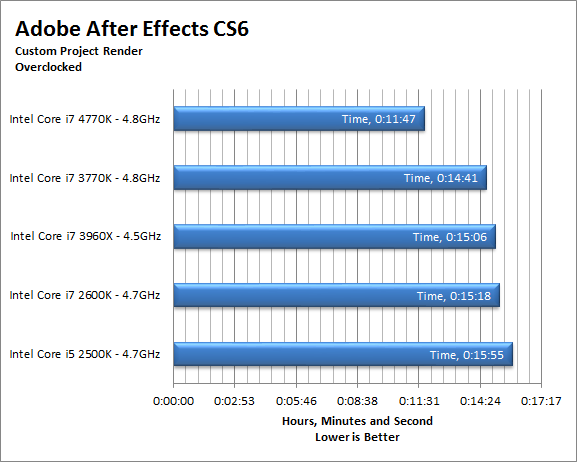 Haswell picks up a bit in Photoshop CS6 performance. There are some filters that that seem to impact the 4770k harder than they did the 3770k, but the overall performance is an improvement over older generations. This should be good news for people that are looking to do a lot of photo manipulation. 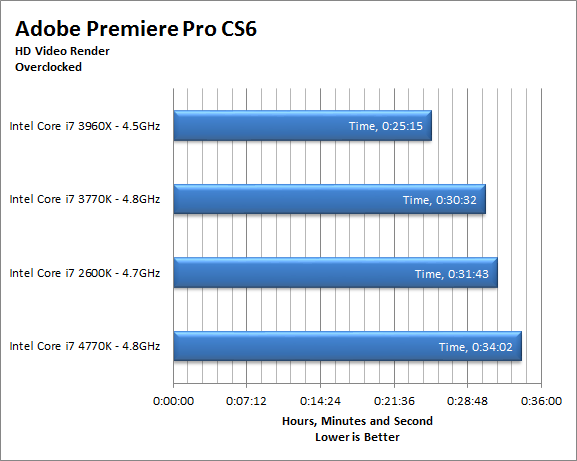 This is also more proof that Intel is leading more toward multimedia performance for their desktop CPUs instead of the raw computing power we are used to seeing. This move is not a bad thing as there is still plenty of headroom, but we still expected to see an overall improvement and not just multimedia. 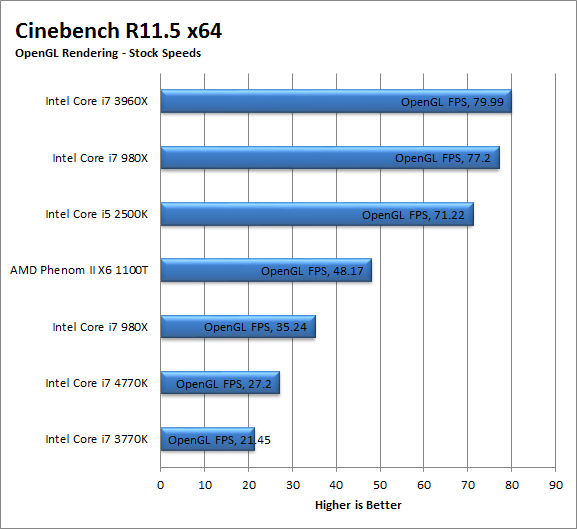 For Cinebench the Intel 4770k manages to push out in from of other CPUs that have the same number of cores under the IHS, but cannot compete with CPUs that have a few extra hands to run things. This is not unexpected as the more cores you have to work on the render load the faster things go. 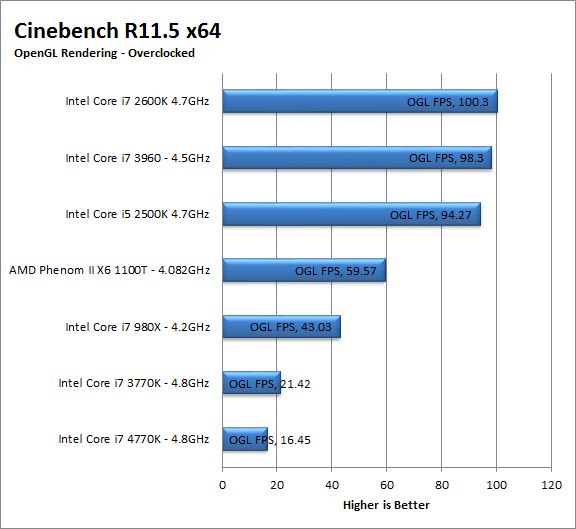 Still the 4770k does beat the older 3770k by a good margin in CPU based rendering. The AVX2 and multimedia improvements that Intel stuffed into the 4770k show their usefulness in our LightWave testing. 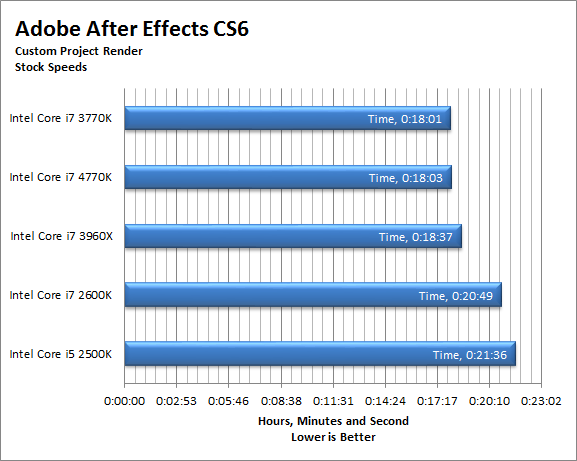 With a healthy 41 second lead in our single 4k render test you can see that you are going to get a nice boost in your productivity. That 41 seconds translates to roughly 12 minutes over a 30 second project. 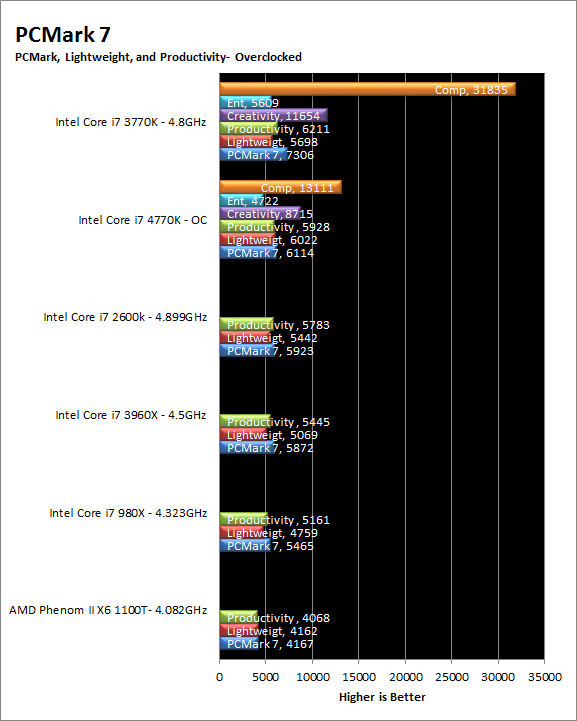 As you might imagine when we overclocked the 4770k things picked up even more. 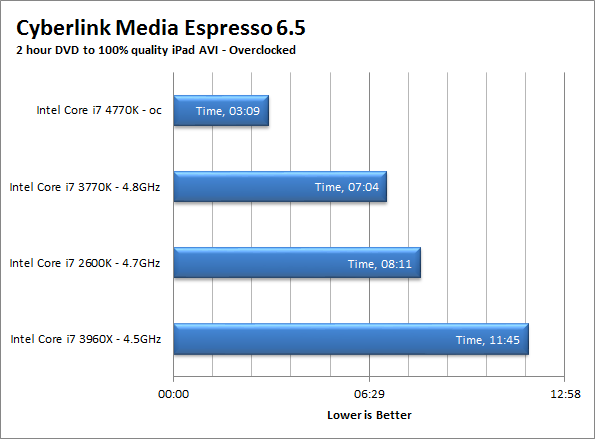 Although we had to run a few updates to Media Espresso we did find that the new 4770k is more than capable of performing transcoding with speeds that are almost half what we saw with the 3770k. Adobe’s After Effects CS6 is an application that can be used to add animation, text and other enhancements to your video productions. This powerful application is built to work with the available memory and can easily saturate even the largest of systems. Because of its multi-threaded design and the fact that it can break out existing system memory into per-thread (or per core) allocations it makes it a great test of a CPU especially one with a built in memory controller. Our test package was put together by Peter Kapas from Bjorn3d specifically to test multi-core/thread systems. The results are the time it takes the system to render the “Mountain Dew” test file. The 4770k performs well with our Mountain Dew test, and comes in right around the same time as the 3770k The 2 second difference (0.2%) shown here is well inside the average margin of error for this test. When we overclock the 4770k it pulls way ahead of the others an almost 3 minute lead over the others. 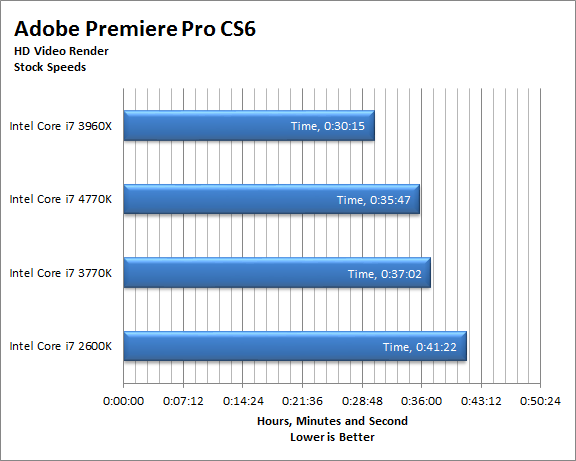 Premiere Pro CS6 from Adobe is a non-linear video editing and rendering application. It has components that allow you take your raw footage and turn it into a full blown video production complete with professional style transitions, audio and video effects and more. You can use Premiere Pro to combine or overlay multiple video and audio streams in the same user interface. Our testing here is with two AVHDC streams that were shot using our Canon Vixia XA10. The original resolution is full 1080p and we render it as shown below. To add some additional work to the normal load we added in five transitions (fold-up, push, slide, cube spin, fade to white) along with an audio exponential fade at the beginning and end. We also added in an extra layer that was reduced in size to fit in a picture-in-picture format (in the upper left hand corner. Oddly enough we see some unusual times here. The 4770k at stock speeds manages our tests quite well and comes in right under the Core i7 3960X (more cores four channels of RAM). The problem comes when we overclock the 4770k. Here we see it drop back to the bottom of the group which is unusual. We ran this test more than our usual three to confirm this and received similar results. Lightroom is a photo post-production software and while it cannot replace Photoshop in terms of editing or creating images, it has many features that are excellent in their own right. One of the ones that we find the more interesting (and beneficial to us) is the use of batch exporting for RAW camera files. This one feature can make it much easier to transfer the RAW images we shoot on our Canon Digital Rebel T1i all using the same settings (color profile, black level etc). For our testing we take 100 RAW files (around 1.7GB) and convert them to 75% quality JPEGs at 1536x1024 resolution (72 dpi). We add some metadata to identify the images and export them to a sub folder in the same original folder. We time this to see how well the CPU performs its duty. The results are shown below. Looks like things are picking up on batch conversions. We are expecting to see this time push under one minute very soon as CPUs and software improve in the near future. 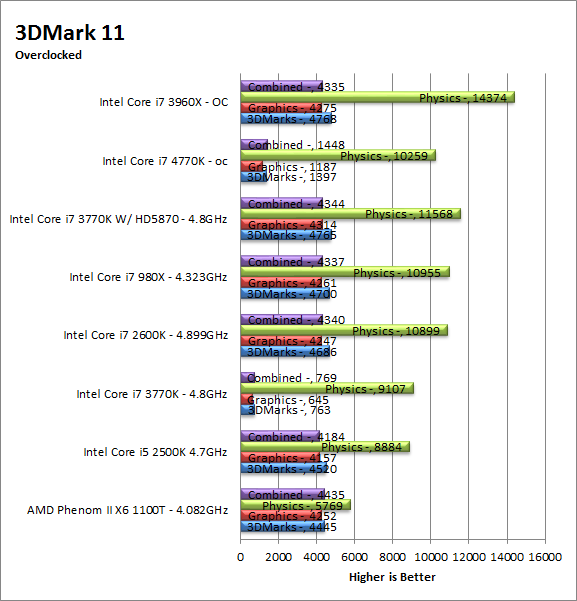 The 4770k certainly stand out here quite nicely. The Intel Core i7 4770k will set you back about $350 from your average e-tailer. This is not a bad price for the top end CPU in Intel’s line up. However, we are not sure that the software environment is quite ready to take advantage of the new AVX2 instructions. This means that the cost of getting the new CPU along with a new motherboard might be a little much for the average consumer. For the enthusiast and the overclocker the cost of the 4770k plus new Z87 motherboard might also be outside what they want to give up just to get the latest and greatest. This does not mean that the new Core i7 4770k is at a bad price point, just that the cost of the full upgrade might make some pause. Intel’s new Haswell based Core i7 4770k is a solid CPU, but as we can see from some of the tests not every piece of software will be able to take advantage of what it has to offer. There is also the possibility that motherboard makers will need to tweak their products to deal with some of the performance issues we saw during our testing runs. Haswell also shows that Intel is beginning to make the shift from raw compute power to a more media-centric product. This is clear in the industry and we see software developers change their focus from the desktop to the cloud. It also represents a move to satisfy consumer needs. Over the past few years the consumer has been inundated with more media content and higher resolution products including streamed media. Intel must change their core offering to meet this demand and they have done that in Haswell. On the down side there are other areas of the computer market that are potentially going to get left out at least at this level. We imagine that Intel is also aware of this and will be addressing it in Haswell-E, which is being designed for the power-user and enthusiast. We will continue to test the 4770k with other boards and are also continuing to work with the companies that provide our testing software to identify any weaknesses in the current products.